Borough cellist Thirzah Bendokas has toured as a solo artist all over New England. NAUGATUCK — Borough cellist Thirzah Bendokas is on a mission to take her instrument from the back of the orchestra to the forefront of classical and popular music. The instrument many people associate with the base line in a string quartet is actually the only string instrument with the full range of human voices, from bass to soprano, according to Bendokas. “My object is always to introduce the public to the beautiful singing voices of the cello,” Bendokas said. Back in the Valley following a whirlwind tour of Cape Cod, Bendokas is doing just that. “I let the cello play a lot of melody. … I am showing it off as a soloist,” she said. Her Cape Cod tour took her to 10 concerts from Falmouth, Mass. to Hyannis Port, Mass. over four days the week of Sept. 11. “I didn’t see much other than concert halls,” Bendokas said. She said most people in her audiences haven’t heard cello as a solo instrument before. “People say, ‘I couldn’t believe that came out of the cello.’ They just seem very happy and delighted to learn about the cello and what it can play,” Bendokas said. 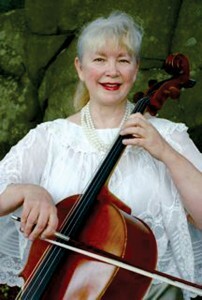 Bendokas has been touring New England as a professional cellist for years. How many, she won’t say. She’s been soloist with virtually every symphony in Connecticut. Bendokas said playing the cello takes a lot of work and hours of study to memorize the songs. “I think it makes a better connection with the audience if you can perform directly to them without a music stand between you and the audience,” Bendokas said. She said she can express herself better when a song is in her mind rather than reading notes. “It’s just a more complete interpretation of the music. That’s instantly felt by the audience,” Bendokas said. Bendokas approaches each piece of new music slowly and analytically. “It’s kind of a natural process. The more you work on a piece, the more it becomes part of you, then the more you can interpret it,” Bendokas said. She said each musician has a completely different take on the same piece. Once, Bendokas said she was working on a Hungarian rhapsody and thought she really understood the music and was playing it as the composer intended. She asked for advice from a Hungarian music director she was working with at the time and found his interpretation was very different from her own. “I found that very enlightening. … As long as yours is a sincere interpretation and you do it honestly from you heart, it’s correct,” Bendokas said. When putting together a concert, Bendokas said she chooses some of her own favorites, audience favorites, something classical, exciting, or new. Sometimes the concert has a theme built around a specific composer or country. “My program does change all the time. … It’s whatever I’m inspired by at the moment,” Bendokas said. For Bendokas, stringed instruments reverberate deep in her family. Her parents were both amateur musicians, and he sister is professional violinist in Orlando, Fla. Her uncle and grandparents played violin as well. With all the violins in the family, Bendokas said, cello was actually her mother’s idea. She had heard it on the radio and thought it was the most beautiful song she had ever heard, Bendokas said. As a teenager, Bendokas studied with a famous cellist. After high school, she attended Mannes College of Music in New York City for two years before transferring to Julliard School. “Being a Julliard graduate, of course I have quite a large classical repertoire,” Bendokas said. She also plays opera and popular songs from Disney to Broadway show tunes. Bendokas even plays the occasional Irish jig. “I always felt that the cello was at a great disadvantage to the violin playing an Irish jig. When a violin plays an Irish jig, it becomes a fiddle,” Bendokas said. “The audience gets a kick out of that. … Now it’s all even-steven with the violin,” Bendokas said. Bendokas will be playing a free outdoor concert at the L.B.D. Performing Arts Center at Westover School in Middlebury Nov. 13 at 4 p.m. The concert will be recorded live for a CD and filmed for cable television, Bendokas said. A CD of Bendokas’ music, “Cellobration” is available to order by e-mailing her at ctconcerts@gmail.com. Bendokas said she’s working on a second CD. “I feel very lucky to be a musician. It makes people happy when you play for them and of course that makes you very glad. It seems to be quite a positive thing. … You meet wonderful people,” Bendokas said.